Description: Sexes similar. Blue-gray crown; white eyebrow bordered above and below with black; dark olive back, with darker wings and tail; white below; no wing bars; ruby red eye of adults is visible at close range. 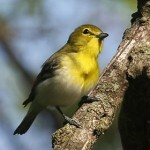 Immatures have brown eyes, and pale yellow on flanks and undertail coverts. Habitat: Deciduous forests with rather open canopies and fairly large trees. 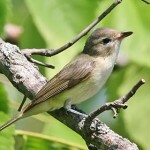 Where in Nebraska: Common spring and fall migrant across the state, and common summer resident in wooded areas of eastern Nebraska. Locally extends west along river valleys. Regular breeder. Field Notes: Aggressive towards birds as large as Pileated Woodpeckers around its nest. 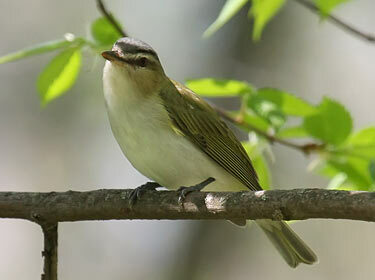 Fun Facts: During the summer months the diet of Red-eyed Vireo’s consists of 85% insects, in the winter they eat entirely fruit. 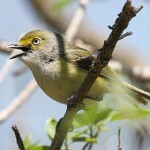 Males average a repertoire of 40 song types and rarely sing the same sone type in succession.